I have breakfast the next morning at the hostel with Anna, and as I get dressed I realize something sad: I forgot to pack something blue. How can I have forgotten the color of Tiana’s most iconic moment– her frog kiss on the balcony with Naveen? In fact…how am I going to have a frog kiss, anyway? It isn’t exactly something I’ve worked into my itinerary. I shrug and shake the thought away. I mean, a frog kiss would have been perfect, but I’ve had so many magical moments on this trip. Why stress a detail? Deep down, though, that missing piece of Tiana’s adventure irritates me. Little do I know how, without my planning a thing, the next few days would conspire to make my wish come true. I don’t spend today with Anna/Lottie…but only because another of Tiana’s loved ones has arrived in New Orleans at last. Tiana had a deep and affectionate relationship with her mother, Eudora. So you can imagine my delight when my fabulous Aunt Ifueko, after whom I was named, flew in from London to see me in New Orleans! She’s staying for a few days with one of her old college friends, who lives just outside New Orleans. 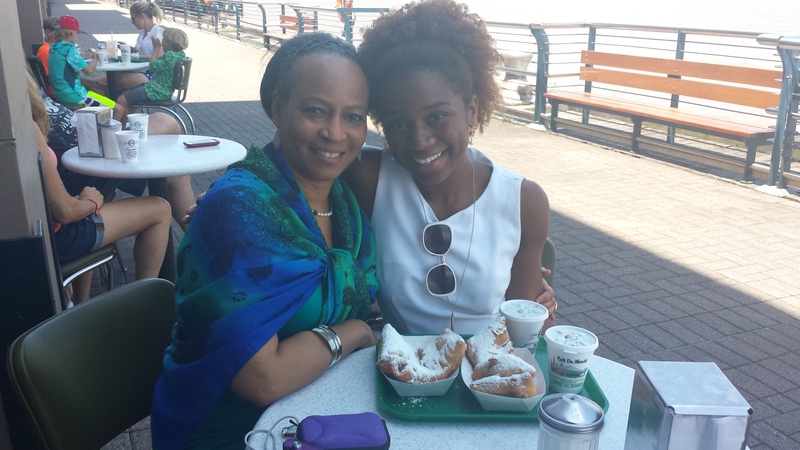 Over beignets on the Riverwalk, I tell Auntie Ifueko excitedly about my travel project and all the things I have planned for us to do. “Oh- well you know I walk quite a bit, darling,” Auntie Ifueko says in her lovely Anglo-Nigerian accent, blinking at me in amusement. “I’m from London.” I laugh, remembering that when I visited my aunt in London, I got tired far before she ever did. I grin. There is one area in which Auntie Ifueko has the entire world beat: retail. I mean, I love a good mall day, But if I’m a retail warrior, Auntie is a shopping gladiator. 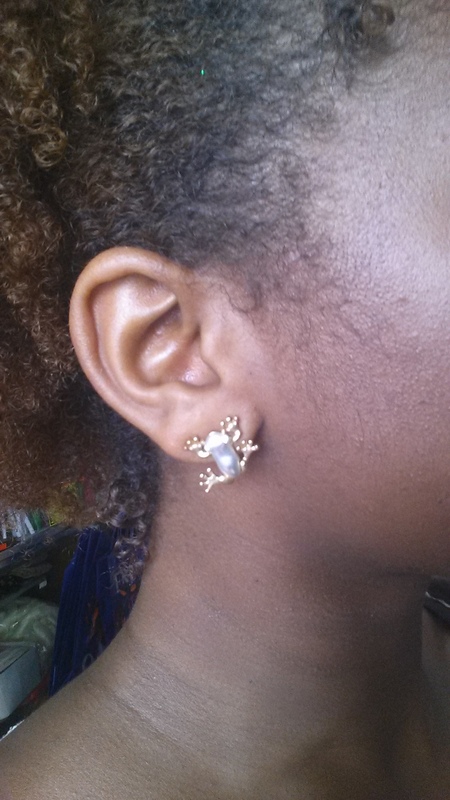 Just as I’m about to leave the store, a small pair of earrings catches my eye. They’re two-toned, silver with gold accents. I smile: they’re a pair of frogs. Right as we’re about to leave the Riverwalk mall, I duck into a Forever 21 on a whim. Then out of the corner of my eye, hidden on an overstuffed sales rack…I see a swatch of pale robin’s egg blue. I wave Auntie Ifueko goodbye for the day, promising to meet her tomorrow morning. 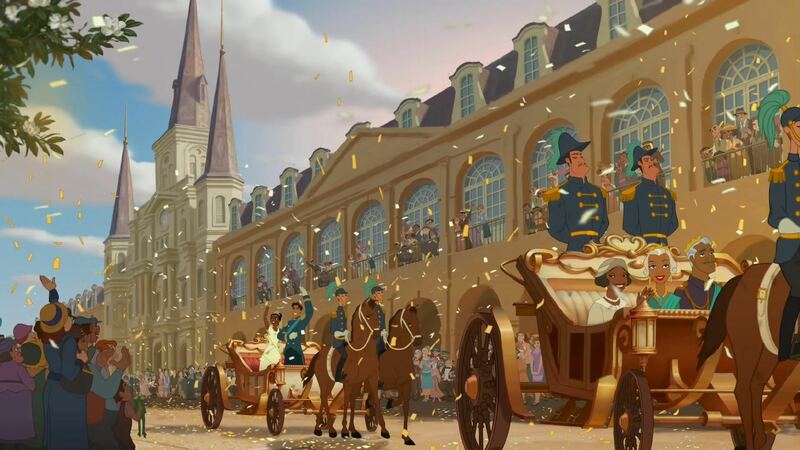 I’m tired, but since I’m already at the city center, I decide to commemorate one of Tiana’s happiest moments: her wedding day at St. Louis’ Cathedral. 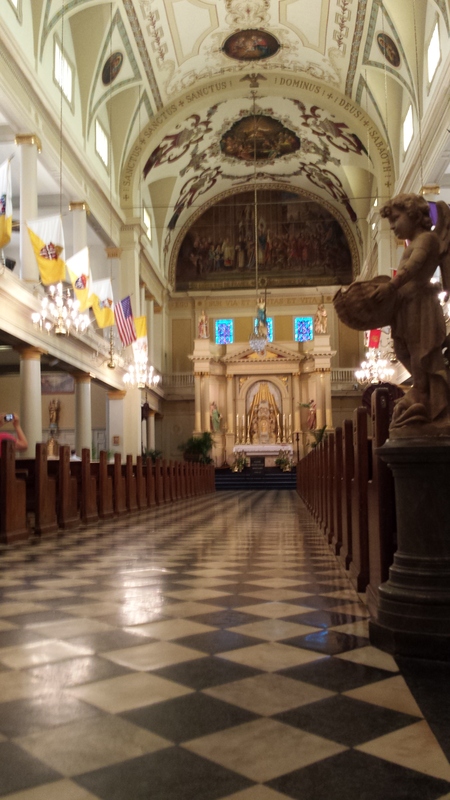 I may not be getting married, but the St. Louis Cathedral is magical all the same. I cheer for the couple taking wedding pictures outside the gorgeous old architecture, and over the next couple days I would return to sit quietly in the lovely interior, thanking God for letting me have a week in Tiana’s story. 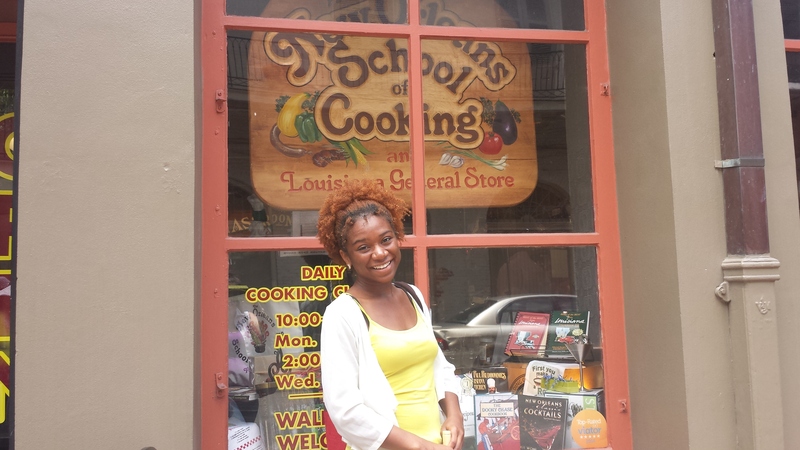 The next morning I wait excitedly on a corner of Decatour Street, where I’ve agreed to meet my aunt before my next step in Tiana’s shoes: a New Orleans cooking class. It strikes me as amusing that I’m living Tiana’s story backwards– two days before I leave New Orleans, I’m back where all the magic began. Sporting Tiana’s classic yellow and white of course! Turns out the class I signed up for is more of a fancy demonstration than a hands-on cooking class! This wouldn’t have suited the hard-working Tiana at all, but I admit, it felt nice to relax in the theater-style kitchen, watching the charismatic chef crack jokes as he whipped up mouthwatering masterpieces. We take our seats and watch the famous chef, the easily 6-foot-5 Kevin Belton, conjure up gumbo, jambalaya, and praline bread pudding from scratch. In between his jokes and stories about Louisiana culture, we learn about the “holy trinity” of New Orleans cooking: onions, bell pepper, and celery. The result is easily one of the best meals I’ve ever had. Three bites, and I find myself wishing the Tiana’s Palace restaurant was real, with chains throughout the entire country. 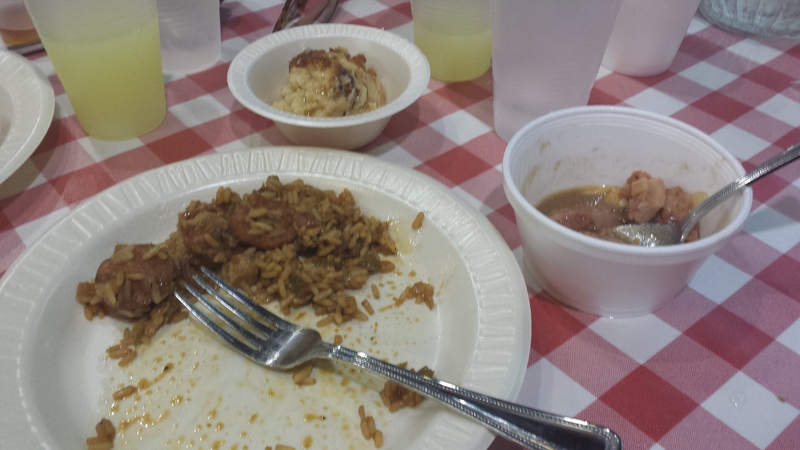 If I lived in Louisiana, I’d be a goner- a doomed, happily pudgy goner. I giggled as the chef submitted to our coddling, and did, indeed, show dimples for the picture. 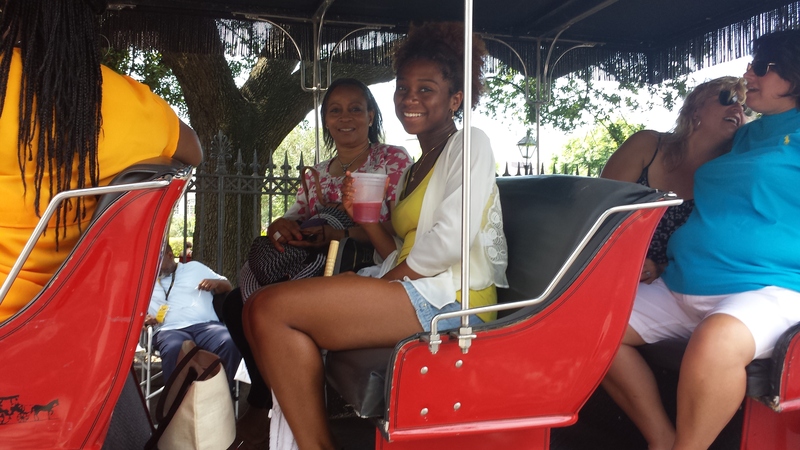 The next item on our agenda is a carriage ride through the French Quarter, Tiana’s-Wedding-Style. But the driver hasn’t found enough people to start the tour yet, so to pass the time we do what the two Ifuekos do best:window shopping! I don’t think I’ll find anything I want in the tourist shops, since now I’ve been in New Orleans for days. Then amidst rows of brick-a-brac, I see a glittering collection that makes me shake my head and smile: tiaras. First the blouse, now the tiara. At this point, it feels like I’ve started some frog kiss scavenger hunt without even knowing it. Now all that’s missing is a frog and a balcony. The latter I think I can find easily…but where can I find a frog? 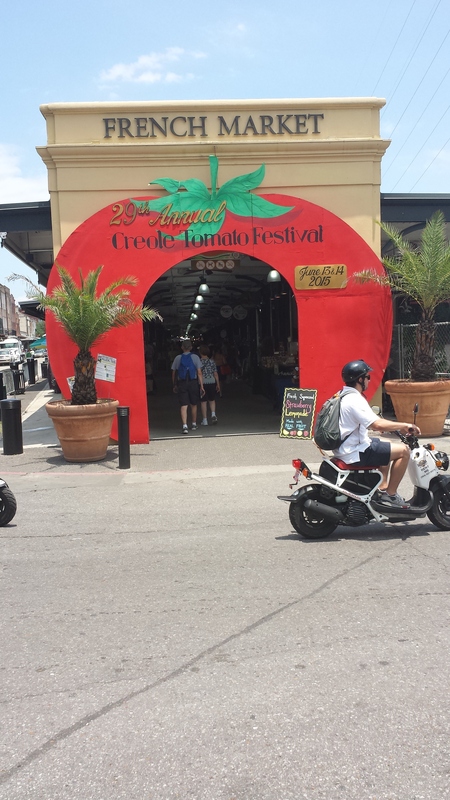 The historic French Market teems with vendors and blisters with heat, even though it’s covered from the sun. I admire the rows of jewelry and artwork, making a few impulse buys, while my cunning aunt barters the vendors down to low prices I’d never think possible. “Any frogs?” I ask of every vendor, and they show me chintzy frog rings and glittery necklaces. Of course I wasn’t expecting a real frog, but none of these seem quite right. I shrug and move on. 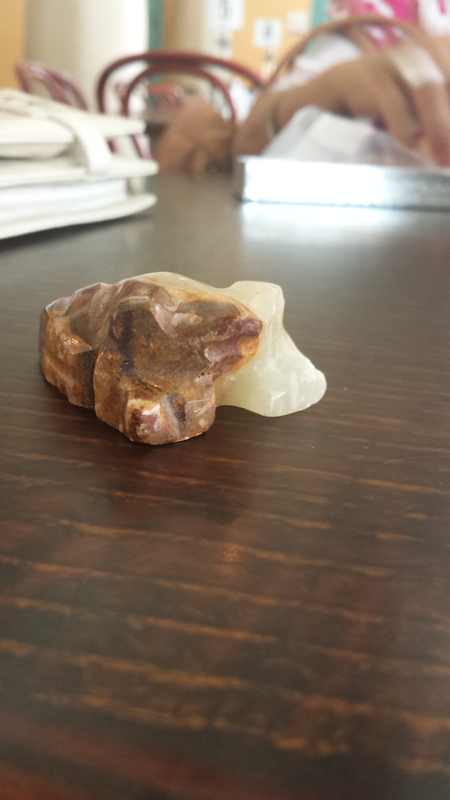 Near the end of our browsing, I see a table with ethnic marble sculptures, manned by a sweaty young man. My eyes scan the smooth stone animals and patterns..and stop. Are they…yes, they’re what I think they are. Two multi-colored, intricately hewn marble frogs. I pick them up, admiring them this way and that, and suddenly there’s someone in my face. It takes me a moment to realize I’m getting hit on. I smile wryly and put the frog down, about to walk away. And that, at long last, is how the Princess found her frog. “I will,” I say, and I mean it. 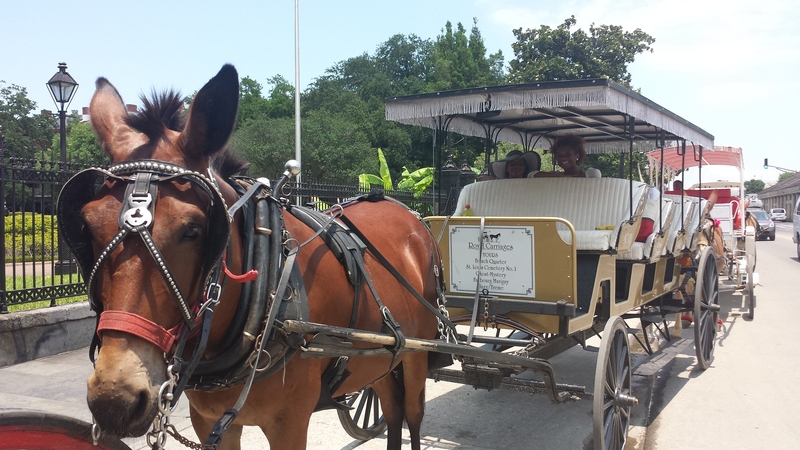 I decide to look for a balcony later that evening, and celebrate my find with a cool daquiri and breezy carriage ride through the historic New Orleans French Quarter. After waving my aunt goodbye for the day, I steal into a bathroom and change into my blue Tiana blouse. I laugh at my own silliness as I spritz myself with perfume, and plunk the tiara on my head. It’s not like I’m going to meet a real frog prince…but I want the moment to be special anyway. Now I just have to find a balcony. But there’s one factor I hadn’t accounted for: my phone is almost dead, and so is my external battery. I can’t have a balcony moment without capturing it on camera! I’ll just have to find a balcony quickly. Shouldn’t be hard, right? With less than 20% power on my phone, I’m faint from heat and walking, and frustrated. There are the balconies on the infamous Bourbon Street, but I can’t be there by myself after dark– especially with a dying phone. I take a deep breath. I’m supposed to be learning something from this. What would Tiana do? Promise me you’ll never forget what’s important, Tiana’s mother had told her, when Tiana got too caught up in ambitions. What’s important? 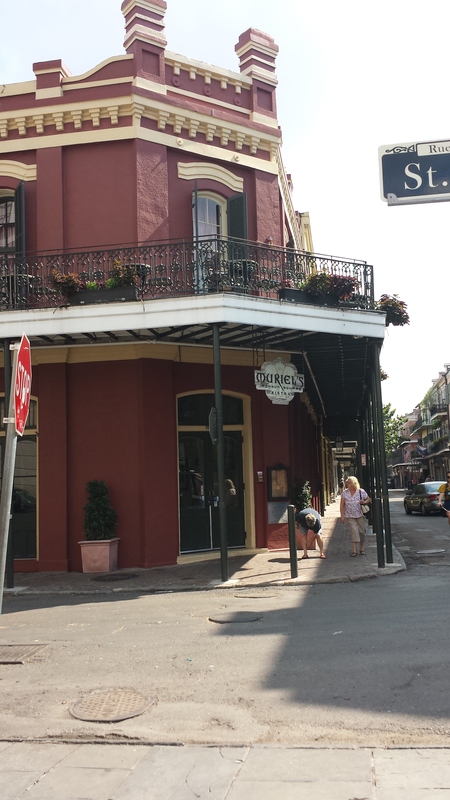 That I get the picture perfect moment on a fancy French Quarter balcony? Or that I got to have a magical adventure I’ve ever had, and see my aunt, and make memories I’ll never forget my entire life? Just then, I know the balcony I should have chosen all along. It isn’t the rod-iron fairytale place of my dreams– but it has come to feel like home. I turn around, hop on the streetcar, and return to the Site 61 hostel. I climb the creaky stairs to the dusty abandoned balcony overlooking Tulane Street. Then as the sun sets behind me, frog in hand, I close my eyes and make a wish. I’m gonna miss you, New Orleans. I was going to finish this series by cataloging the last thing I did, which was ride the River Steamboat Natchez, and dance to jazz with my aunt on the deck. But I want to end on a more serious note: why deep down, I went on this trip in the first place. Diverse representation in fiction matters. I can’t stress enough that even if Tiana is one blip in a homogeneous industry, she is beautiful, and her story is worth telling. I want you to imagine for a moment a little girl who loved fairy tales. She loved the heightened beauty they offered, the danger, the hope, the towering stakes. She loved them all so much that a very young age, she started writing stories of her own. But for some reason, she always wrote about little girls with “pale delicate skin” or “emerald green eyes” — “long red hair” or “pink rosy lips.” None of this would have been strange…except that the little girl was African American. 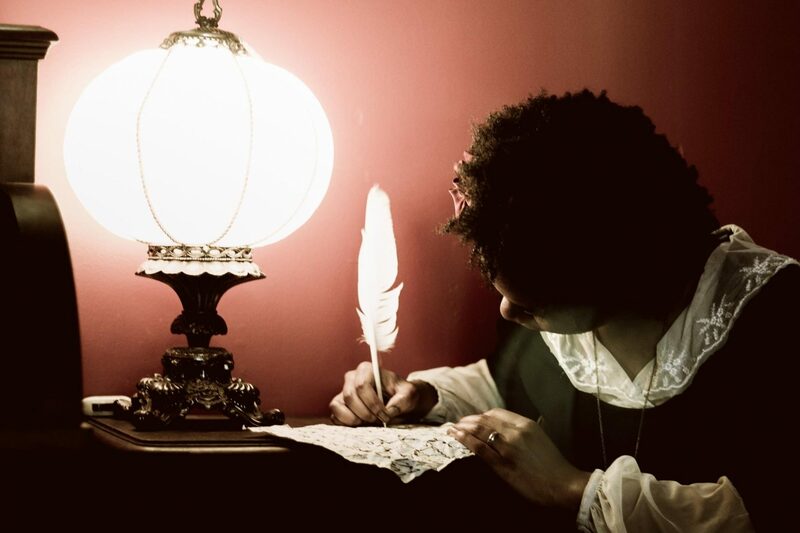 I wrote stories that way, at ages 8, 9,10, 12, because I even though I didn’t think I was ugly, I could not see myself in that world of magic and beauty. Protagonists did not have brown skin. Princesses did not have dark, springy hair. A heroine was something specific, something that mattered, and something that was not me. Yet I continued to cherish a world of stories that never cherished me back. 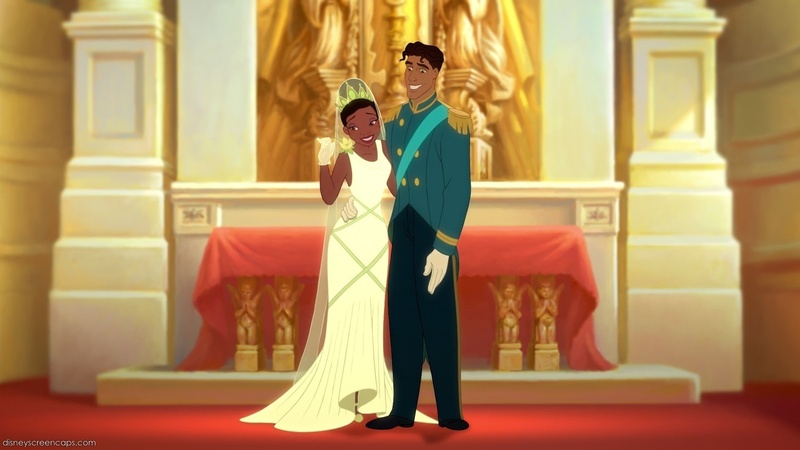 And years later, in college, I first saw a preview for the Princess and the Frog…I burst into tears. Right there in theater. Heck, I’m crying now as I write this. Because for the space of a 3 minute preview, the world had suddenly decided that my story mattered. 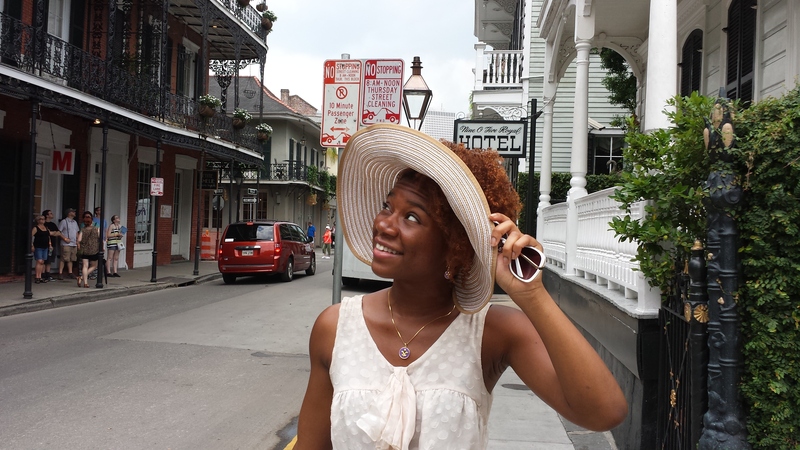 As our world continues to roll out story after story- as little girls with black skin and brown skin and long names and monolidded eyes continue to crane their necks for a heroine that reflects them– this trip was my way of immortalizing Tiana. Of telling those little girls, past and present: Yes, we are heroines. Yes, we are beautiful and worthy of adventure. And yes, our stories matter. 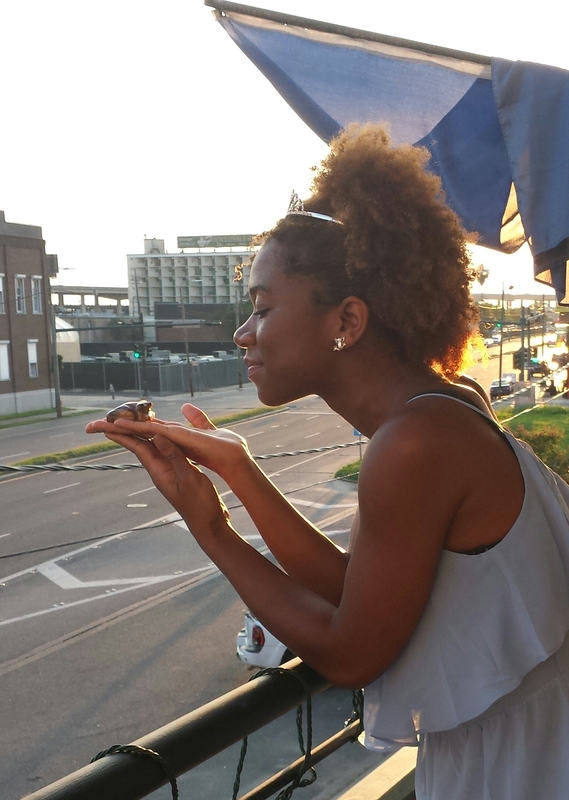 So here’s to you, Tiana of New Orleans. Just wanted to say – wonderful writing! It seems like such a fantastic project to do – and you made it truly personal. 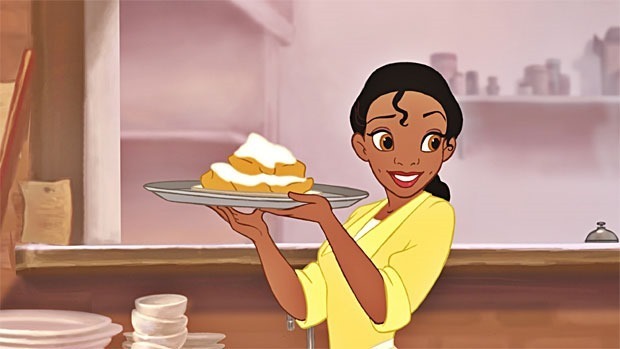 Although I may never appreciate the extent to which Tiana is important to young black girls such as yourself when you were young, I think it’s important to point out that Tiana is a fantastic heroine regardless of her appearance. This isn’t just disney who has chosen to create a black heroine just for the sake of seeming diverse – this is disney who’s created an absolutely wonderful heroine. I always feel that people seem to dub Tiana “the black princess”. No – as you’ve shown, she’s special in other ways. Yes, she does show young girls with dark skin, and “springy hair” as you put it, that green eyes and fair skin do not a princess make, but she also comes from an incredibly rich culture, is extraordinarily hard working and is extremely kind. She celebrates diversity beyond appearances – in much the same way as you, dear author, do. Diverse representation for the sake of diverse representation… I’m not in a position to comment about it – but I don’t believe it means much. If an author or a firm includes a POC character just to reach some sort of quota, and doesn’t really give the character any personality at all, apart from their skin colour, which is something many authors do, I feel like it almost takes away the value from that character. The wonderful thing about Tiana and the way you’ve spoken about her is that she’s a heroine in her own right. They didn’t just settle for skin colour – they made her probably one of the most interesting and inspirational princesses in the whole disney lineup. Strip her of her appearance (though I’m not sure why you’d do that – she’s bloody gorgeous, though I do suppose they stripped her of her appearance a little in the film, as they kept her as a frog for so long) – she’s still amazing. Snow White, Sleeping Beauty (as much as I love Aurora) – they are no where near as great as Tiana. I will never be able to fully appreciate the extent to which Tiana is important to young girls with dark skin or springy hair. And I do hope that she is the start of a long line of heroines with dark skin and natural hair – because it would be great, no, we need to see more POC heroines. But, I’d like to point out that she is an inspiration to absolutely everyone, showing that a heroine is far more than skin deep. I wish I had grown up with her. Hey, thanks for reading! I’d mostly agree with you. However, I think we also need to be careful with that line of reasoning as often I’ve seen people say “Well, I don’t want to just be diverse for the sake of being diverse” …and then use that as an excuse not to include any diverse characters in their writing. But specifically aiming to include people of color in fiction is not a pity act. Because diversity in fiction isn’t about making people of color feel better, it’s about reflecting reality. The world is not a homogeneous place, and to neglect that in our stories is simply to be dishonest. From the tone of your comment, I think you’d agree with me, and I’m glad you took the time to share your thoughts! I loved your “Fiction in Real Life” series. 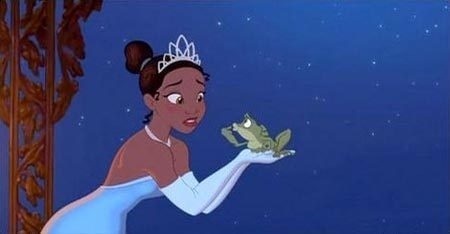 Princess and The Frog is my guilty pleasure movie whenever daily stresses add up to be too much. 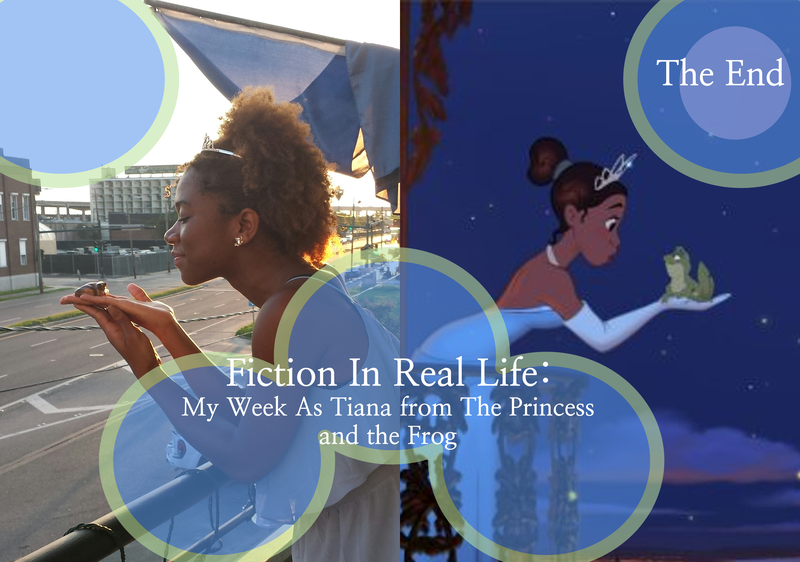 Your blog is charming and felt like I was reading a real life rendition of Tiana’s adventures. I cannot wait until your first book comes out when I can thoroughly enjoy reading it, and someday, cherish reading it to my family. Thank you, that makes me so warm inside :) So glad you enjoyed it. I loved everything about your adventures as Tiana. 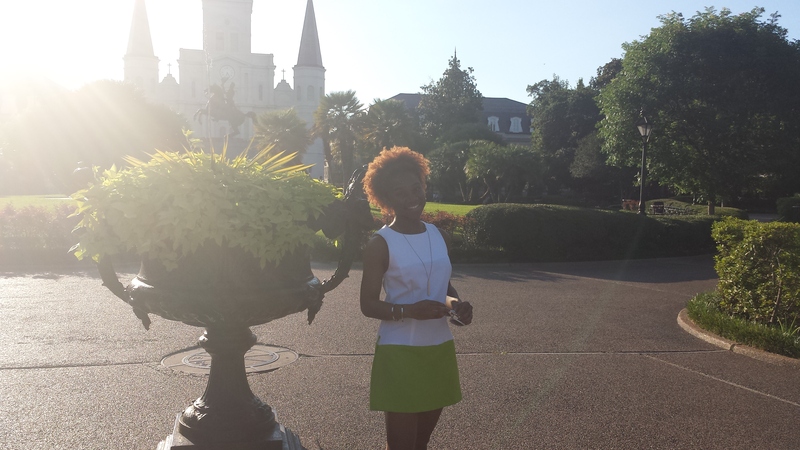 I came across your blog looking for a Tiana inspired New Orleans tour. I pray you continue to live your dreams. Brava!